Mirage uses the highest quality finishes formulated to exceed one of the toughest paint standards in the industry for UV and salt spray resistance, the AAMA 2604. Our products are painted in-house by trained Mirage personnel. This is especially important to ensure proper adhesion to the aluminum parts on the retractable screen door. The Mirage Limited Lifetime Warranty ensures you first time quality on your retractable screen door. 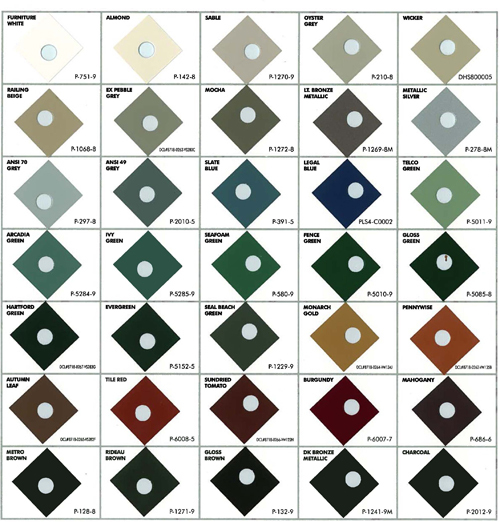 The above aluminum samples are powder coated to represent actual appearance as accurately as possible. Appearance may vary depending on application variables such as film thickness, substrate type, and cure conditions. Other elements such as age, field exposure and lighting conditions may affect color, gloss and how these are perceived and interpreted. Therefore, we cannot guarantee an exact match between these chips and the coating applied at our facility. I am so pleased with my retractable screen door. We can now enjoy the unobstructed view of our back yard through our patio doors. Also, Regina and Ken provided great installation-very neat and efficient. I would recommend this product to anyone. Regina and Ken installed retractable screens on our 2 sliders last spring. We enjoyed not having our view spoiled by screens all summer. We appreciate their service and professionalism. We recommend them highly. Your Retractable Screens are just a click away!